American publisher Penguin will be republishing a number of Manly P. Hall books under its Tarcher imprint. Gearing up for the incoming onslaught of Dan Brown and "the Lost Symbol", Penguin has decided to dedicate one of the episodes of its video series, "Tarcher Talks" to the topic of Freemasonry. Joe Fotinos, vice-president of Penguin, asks questions of Mitch Horowitz, author of "Occult America" and non-Freemason, about a wide range of topics about the Fraternity from the usual, "who is a Freemason" to Freemasonry's connection with the Mormon Church. There is even a surprising connection between the Shrine and Sufism. I really like the candid nature of these videos. There really is no glossing over of the victories and challenges facing the Craft. There are some mistakes made in the videos, including Ronald Reagan being named a Freemason. (He was not a Freemason but he was made an honorary member of the Scottish Rite.) However, I really thought that Mr. Horowitz had some good points about what Masonic Lodges must do with the candidates now that many will seek out our more esoteric side. 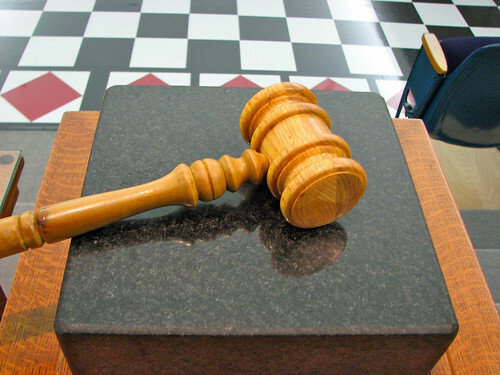 We can't just continue on as a civic organization while ignoring our deeper past. Much of what is focused on in the episode comes from the books by Manly P. Hall. For those not in the know, Hall was the prominent esoteric Freemason of the 20th century. Unlike most writers of the time, he sought a deeper meaning within the symbols of Masonry. He was a prolific writer and speaker on the Craft, giving thousands of lectures and authoring over 150 books. 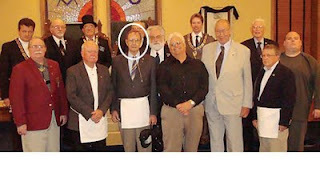 He was awarded the 33rd degree in 1973. He was also the founder of the Philosophical Research Society in Los Angeles. As promised, I've linked to the article and video. 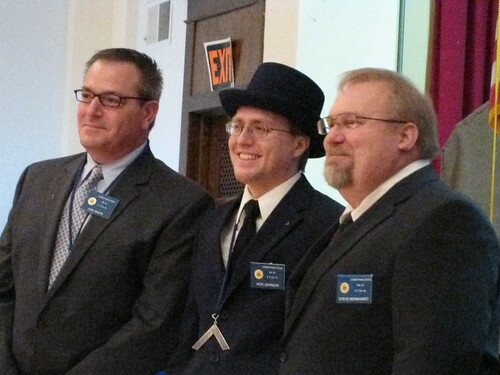 I think that Most Worshipful Brother McCarthy did an outstanding job representing the brothers of Minnesota Masonry. Also, what a great spot to be at, outside the old Masonic building in downtown. It's always fascinating to see how the Profane world looks at Masonry but I think public perception is changing or perhaps its better to say public rediscovery. The media is grabbing onto this story and frankly, no one knows what will happen after next Tuesday. Now, I do differ in opinion with Brother Tabbert, quoted in the article as saying “We might have to spend the next 25 years responding to Dan Brown's fiction. That's what I dread." Most of the story in "the Da Vinci Code" and "Angels and Demons" was fictitious, just as hyperdrives and warp speed are fictitious in "Star Wars" and "Star Trek", respectively. (Wow that was nerdy.) However, it is no less entertaining to wonder, or to question what is true and what is not, and I’m okay with that. I’ve studied the history of Freemasonry in my four years of history and what I’ve learned is that we do not write our own history but we can write our own destiny. There are really two approaches to dealing with any action, proactive or reactive. I’m of the proactive point of view. We can’t stop the media juggernaut, but we can get in front of it. Every brother should think of ways to discuss the Fraternity and trying to put our best foot forward. We aren’t all about pancakes and fish, but we are a Fraternity of an unknown past, of wild theories and observations, of symbolic, mystic, and philosophic wonders, in total, we are one of the most interesting organizations on Earth. People have written volumes and encyclopedias about the minutiae of our Gentle Craft. Research has been done on our connection to the Revolutionary War, Templar Knights, peasant revolts and the Ancient Mysteries of Egypt. We are a fascinating group to read up on as our story is that mysterious. I think the most advantageous point that we will find with this book in everyday Lodge life is that there will be an abrupt return to the educational opportunities to which this book will lead that has been lacking in many Lodges. Some brothers may take this book as fact while others will attempt to debunk every assertion and that is a very good thing. I’m hoping to see an open dialogue among brothers about truth, which is one of our espoused values, in all things Masonic and allowing more than just business about lights to run the meetings. This book will not be absolute truth but it can serve as the string between the cans to get brothers to talk. I was trawling the Internet and noticed that the UGLE has recently updated their website. It looks fantastic and shows that the UGLE has been a standard bearer for the Fraternity around the world. One of the best features of this new site is actually not advertised prominently; someone has had the good sense to create an RSS feed to subscribe to the speeches of the Grand Master and the Pro Grand Master at the Annual and Quarterly Communications. I should mention that the first Grand Lodge to podcast is not the UGLE. The Grand Lodge of Ohio has been publishing a monthly podcast since the summer of 2008. 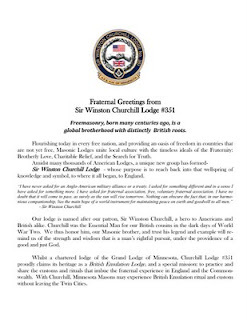 I'm really glad to see Grand Lodges taking an active role in the internet space. The Internet is not only a place for men looking for the Fraternity but also as a way for brothers, new and old, to receive important information about the Craft. 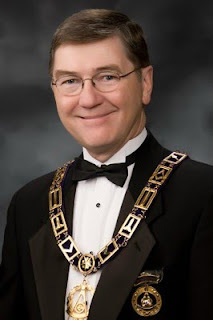 WB Mayfield over at the Palmetto Mason really presents the changes and challenges that the Internet presents to Freemasonry in a post entitled, "The Internet, A Blessing and a Curse for Freemasonry." 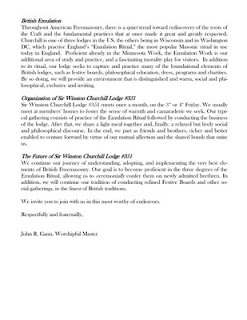 I applaud both of these Grand Lodges for becoming accessible to the public. Hopefully, more Grand Lodges will continue to add content to the ever growing Internet Masonic community. for GL of Ohio's podcast into your podcatching client (instructions for them can be found here: iTunes or Zune).